Elizabeth and William spent their remaining years at 9 Duke street Colne. In their retirement they continued to be involved with their local Parish Church. Elizabeth's ill health prevented her from continuing to work with the St John's Ambulance and she was no longer well enought to be involved in the fund raising projects she worked so hard on in her younger years. 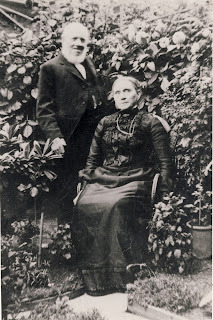 Their surviving children lived close by and their eldest daughter Mathilda who didn't marry continued to live with them. They were in contact with their son Richard who had now established himself as a stone mason in Sydney, Australia. During WWI, two of Richards sons, Richard and William were members of the Australian Army and when they were stationed in England were able to finally meet their grandparents. On the 31 January 1927 Elizabeth sadly passed away and in the following year, 30 May 1928 William joined her. The following tribute was posted in the Colne Times following Elizabeth's funeral. "On Sunday morning the private mourners who were present at the funeral of the late Mrs Taylor of Duke Street, Colne - the veteran ambulance worker whose death we recorded last week - attended the service at the Colne Parish Church. As a tribute of respect to the deceased lady a large number of members of the St. John Ambulance association and the Nursing Division in Colne were also present, and they were accompanied by representatives from Nelson, Brierfield, Burnley, Trawden, foulridge, Earby and Barnoldswick. They were under the command of Corps Supt. W. Heap, with whom was Reserve Supt. 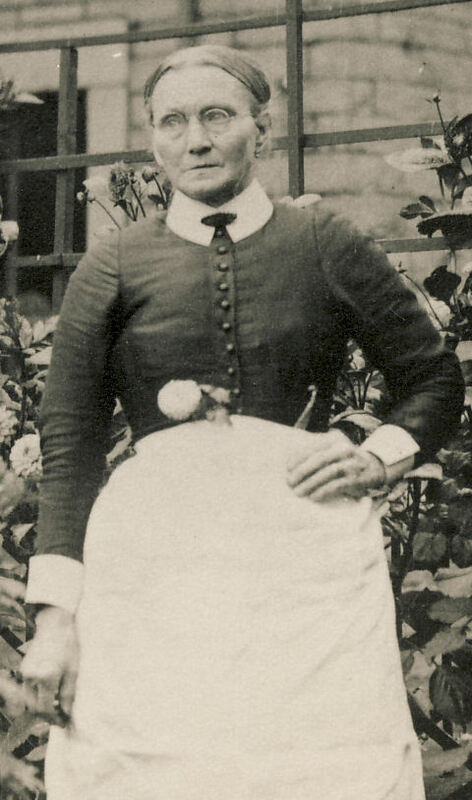 E. Scott, the Lady Corps Supt, Miss Hartley. As the Girl Guides were also present at their usual monthly parade, there was a large congregation, the Church was well filled. "The presence with us this morning of the St. John Ambulance Association, gathered in such large numbers from so many districts, is an eloquent reminder to us of the deep respect in which she was held. Their presence here is no mere post mortem terabyte to her usefulness, for she was he first lady in Colne to be made - many years ago - an Honorary Serving Sister of the Order of St. John of Jerusalem in England, and it was with a common feeling of reality that we named her in the funeral service last Thursday, not "This our sister" but "This our mother", for she was indeed the mother of this noble Order in this town of Colne. 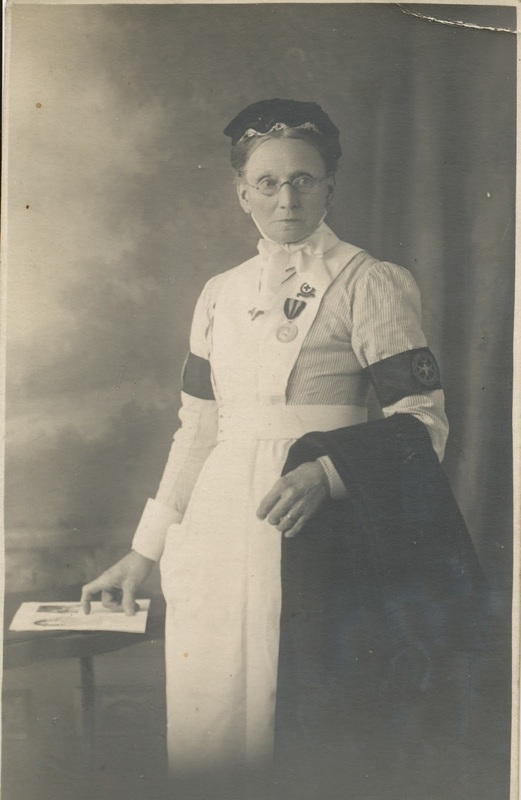 Of her work with the Colne Auxiliary Military Hospital during the war she often loved to speak, and judging from the number of doctors under who she served - long before the day of District Nurses - she seems to have had the world as her parish. Our sympathy is with her family and her many friends, and especially with her aged husband, who is still with us after a married life of over 68 years. I can only conclude this short tribute to her by saying to you all the words with which the Parable of the Good Samaritan concludes: "Go and do thou likewise". During the Service the hymn "The King of Love my Shepherd is" was sung. After the Service the members of the Ambulance Association and Nursing Division returned to the Ambulance hall, where lunch was served to those from a distance." As I type the last few words of Elizabeths story, I have come to the realisation that she was a pioneer in her times, caring for the ill and needy in their homes long before the concept of district nurses was even thought of. Her journal lists the names of 29 doctors from the districts of Rossendale, Burnley, Barroford, Boothfold, Waterfoot, Rawtenstall, Newchurch, Colne, Nelson to name a few. Some of the ailments that she tended were: injury by lightening, maternity, stroke, Brights Disease, typhoid fever, dislocated elbow, tumor on big toe, senile decay, change of life, mild fever, dog bite, cancer. I hope readers have enjoyed the short summary of Elizabeths life and if any reader can add to this story, either with informtion about the St Johns Ambulance, the district of Colne and Barnoldswick or the Taylor and Rushworth families, I would love to hear from them. At the beginning of the 20th Century, William and Elizabeth Taylor lived at 9 Duke Street Colne with five of their six surviving children, William, Lucy, Elizabeth, Matilda and Joseph. The girls were all employed as cotton weavers and William Jr worked in an iron foundry. William Snr enjoyed a position of clerk to the Colne Corporation Yard ( or local council). 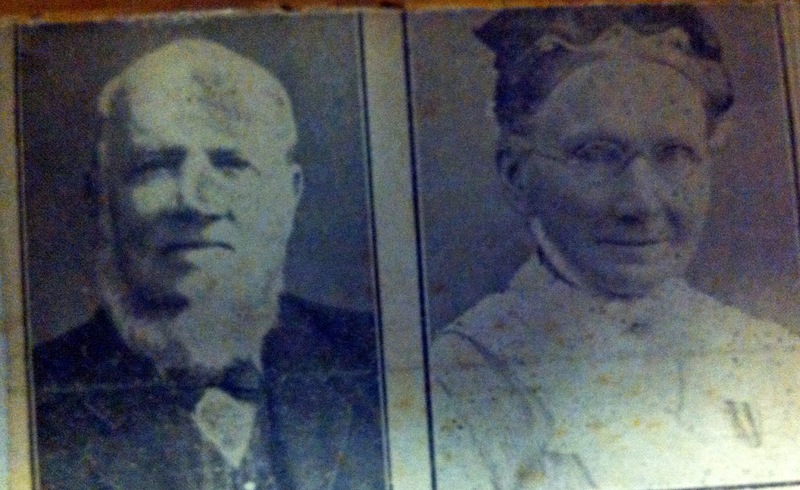 Their elder son Richard had emigrated to Sydney, Australia in the sometime in the 1880's. We can only assume that he decided to seek his fortune in a new country having heard about life in Australia from his uncle and Elizabeth brother Joshua Rushworth (who had moved to Australia with his wife and family in the early 1860's). 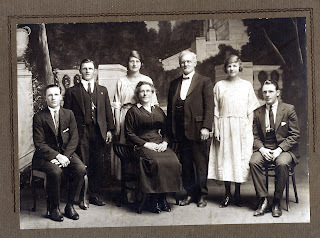 Richard married Marion Millar McNair a native of Torphichen, West Lothian, Scotland, in 1891 and William and Elizabeth's first grandchild William was born on the other side of the world in 1892 in St Peters, Sydney, Australia. This must have seen such a long way away to Elizabeth. We do however know that they family kept in touch as a number of family letters written by William Taylor senior in his beautiful script have survived to this day. "She has taken a prominent part in the development of the movement in Colne including the organising and collection of funds for the new hall in Swan Croft, and in all the social efforts arranged by the association (St Johns Ambulance) for the purpose of raising funds to carry on its work." When War broke out on the 4 August in 1914 the menfolk were quick to volunteer to join the armed forces while at home the women were drawn into working more and more into the mills, taking over the position previously held by the men. * The Colne Military Hospital was established in Albert Rd in 1915 and Elizabeth played an important part in its establishment and resourcing equipment for the Hospital. There is a wonderful picture on the web site of The Lancashire Lantern which shows the nurses outside of the Colne Military Hospital and if you click to enlarge this photo you will see Elizabeth Taylor in her Superintendant Uniform on the left hand side of the picture. She does give an imposing presence. This wonderful battered photo has been passed down through the family and shows nurses, doctors, and recovering soldiers in front of the Colne Military Hospital. Elizabeth Taylor is sitting on the left hand side of the Mayor (man with chain) in the front row. 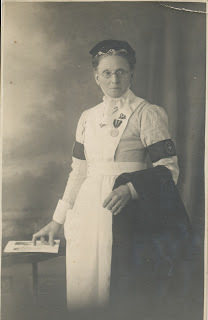 "I became interested in nursing when I was 19 years of age, amongst my own Famly, Relatives and Friends, by whom I was almost considered to be the Family Nurse, which was mostly gratuitous up to about two years after coming to reside at Colne in 1886" . * Harrison, D. 1988, The History of Colne, Pendle Heritage Centre, pp.65-68.